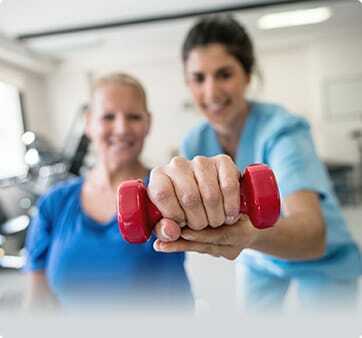 The goal of inpatient rehabilitation is to help patients get back to their lives, families, and friends as quickly as possible – with quality, individualized physical rehabilitation delivered with compassion, dignity, and respect for all. The Wooster Community Hospital inpatient rehabilitation unit is located on the fourth floor of the main hospital building. Referrals for inpatient rehabilitation can be initiated by physicians, patients or their families, discharge planners, and allied health professionals. In addition, a patient's stay on the unit may be covered completely or in part by Medicare or private insurance. Patients receiving inpatient rehab also benefit from 24/7 rehabilitation nursing care and the oversight of a medical director who specializes in neurology and physical medicine and rehabilitation. Working closely with each patient and their family members, the Wooster Community Hospital rehabilitation team designs a customized treatment plan that focuses on potential rather than limitations. Our progressive approach strives to meet the needs of everyone involved in the rehabilitation process, including patients and their loved ones. Don’t take our word for it: Read what our patients have to say about their inpatient rehabilitation experience. For more information about inpatient rehabilitation at Wooster Community Hospital in Ohio, call (330) 263-8421.